Who Will Play Cormoran Strike? A burning question, for those of you who’ve read The Cuckoo’s Calling and/or The Silkworm: who, in a TV or film adaptation of the novels, would play Cormoran Strike? Mr AMR and I have spent hours discussing this most important subject and, despite trawling through every single actor in the world on IMDB, we still haven’t found our man. 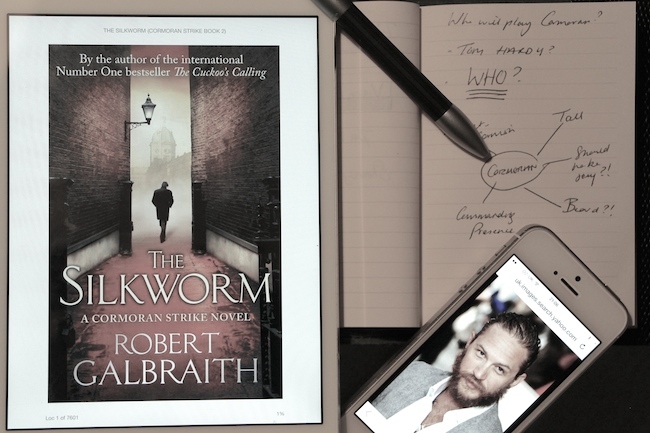 If you haven’t the faintest clue what I’m on about then you need to get stuck into the new Cormoran Strike detective novels that are topping the bestseller lists; J.K. Rowling has been writing them under a pseudonym, Robert Galbraith, and they are proving to be quite the flavour of the year. They’re well-paced and filled with colourful personalities and although I’ve been a tiny bit disappointed with the endings in both cases, I thoroughly enjoyed them and couldn’t put them down! The main character, Cormoran, is a huge, hairy, ex-army interrogator with one-and-a-half legs and a psychopathic ex-girlfriend; he’s one of those characters you find yourself rooting for. Something of an underdog, living in his office with a fold-away camp-bed and boxes filled with his belongings, but also a figure with a bit of clout and authority, not least because of his huge size. What I like about Cormoran is that he’s fallible; throughout the novels you see him at his most vulnerable and pathetic as well as at his most professionally triumphant. In one moment he might be casually threatening a potential suspect, the next he might be slipping over on his false leg. He would be a very interesting character to play in a film or TV series, I’d imagine. And so who would play him? Who would play Cormoran Strike? As I said, Mr AMR and I are at a loss; the closest we have come to a possible is Tom Hardy, but I think that’s just because we both love Tom Hardy. A friend pointed out that perhaps Hardy would be a bit on the short side (Cormoran is over six foot tall, Hardy is apparently around 5’8″) but is that a deal-breaker? He played Bane in Batman, after all; Bane’s the biggest guy on the planet. We are both desperate for suggestions so please leave them below – now there’s something enjoyable and entirely pointless to do with your Saturday morning! Previous Post The Trenchcoat of Preciousness.